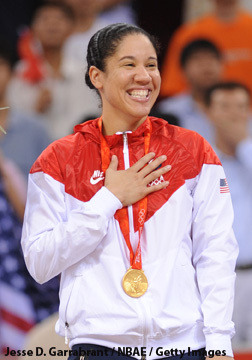 Kara Lawson, an Alexandria, Virginia native, graduated from West Springfield High School, where she played on the girls’ basketball and soccer teams. During her high school basketball career, Lawson led the Spartans to state championships in 1997 and 1999, and earned Women’s Basketball Coaches Association All-American honors. She played in the 1999 WBCA High School All-America Game, scoring 20 points, and being named the game’s Most Valuable Player. Lawson went on to play for legendary women’s college basketball coach Pat Summitt at the University of Tennessee. During her playing career as a Lady Vol, she was a two time All-American, and was one of three Tennessee players to be named 1st Team All-SEC four times. She led the Lady Vols to three NCAA Women’s Final Four appearances in 2000, 2002, and 2003, and was awarded the Frances Pomeroy Naismith Award from the Women’s Basketball Coaches Association recognizing the best senior player under 5 ft. 8 in. Lawson was drafted 5th overall by the WNBA’s Detroit Shock in 2003, starting a 12-year career highlighted by a WNBA championship in 2005 with the Sacramento Monarchs, and All-Star honors in 2007. During her career, Lawson would also make an impact on the international level. She was an integral part of the 2001 USA women’s basketball gold medal team at the World University Games, as well as the 2008 gold medal winning US Women’s Olympic team in Beijing. In the gold medal game against Australia, Lawson led the team with 15-points and didn’t miss a shot from the floor. During her WNBA days, Lawson began a very successful broadcasting career with ESPN, where she still works as a game analyst. This season she joined the Washington Wizards’ telecast network as the lead game analyst – one of only two women in that role for an NBA club.